If you could read my mind, you wouldn't be smiling. Oh this book. It's the type of story you want to hung tightly just as you finish reading it. I was captivated by Sam's struggles, as well as her triumphs, throughout the novel. Encountering a story involving a character with such a strong narrative is something I am always drawn to. Sam felt very authentic and alive to me, from page to page. I caught myself tearing up in moments, emotionally tied to the story, creating an investment I had to see through. On the surface Sam's world portrays a very typical, "normal" high school girl's life. Her biggest worry is what to wear to school, and the latest gossip from her group of girl friends. However, beneath that surface there lies a much deeper, more gripping story waiting to be told. She struggles with a particular type of OCD, one that I must admit I was not fully educated on. Not only did I enjoy this story for its narrative, but I also took away a sense of knowledge and understanding that I did not have before. I applauded Sam as she branched out and found new friendships among the Poet's Corner at her school -- this "underground" group of teens who come together to share their poetry, expressing their inner thoughts and most personal emotions. Through this group, Sam begins to understand her boundaries, and even pushes herself to unknown territories. I liked the presence of Sam's therapist and her mother, who were both very strong, solid influential people in her life. It created that safe zone for Sam that she so desperately needed when her thoughts ran away with her. In the end, Sam delivers a touching, triumphant, and poignant journey. She stumbled quite a bit along the way, but she gained so much more ground than she ever had before. I found myself applauding her bravery, and understanding her demons. This story is the type of novel that will force you to step outside your own and truly look at others in a new light. I really appreciate the eye-opening experience Tamara Ireland Stone has awarded me with by writing this narrative. I feel that it's a story to reflect on, and continue talking about, so that we create a deeper understanding for all types of people. 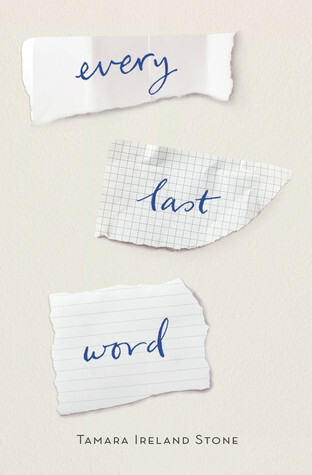 I absolutely LOVED Every Last Word! Sam was such a great character to read about, and her journey, hard as it was, was also inspiring and I was completely emotionally invested in it. So glad you enjoyed it too! falling on thy indelible, magnificent, vigilant cranium? and an extraordinarily, sawcy, rowdy victory? ?